OUR ULTIMATE LAPTOP WORKSTATION ALLOWS YOU TO RELAX OR WORK ON THE COUCH, THE FLOOR OR IN BED! Are you looking for a table that can hold your computer, mouse, writing materials, while you work on the sofa or in bed? Are you tired of straining your back just to get a proper view of the moving you are watching in bed? Are you tired of laptop burns due to placing your computer on your laps while gaming? This innovative table can solve all these challenges and even more like recharging your tablets or smartphones plus a free led flashlight so you can see properly! AMPLE TABLE SPACE - Offers ample space to carry your 14-17" notebook computer. EASY STORAGE - Compact with legs that can be folded to enhance storage. DURABLE - Sturdy and made from quality ABS plastic with reinforced tungsten steel. LIGHTWEIGHT - Portable and easily carried from bedroom to dining to couch, etc. ADJUSTABLE - The height and viewing angle of the table can adjusted for a better experience. INNOVATIVE DESIGN - With built in power bank, you can continue working or watching movies without fear of power disruptions! Q: How to get the table leg back? A: Just pull it slightly backward before push back. Q: What's the size of table? A: The width between legs is 78cm/30", Max desk height is 32.5cm/12.79". The desk is fit for 17" below laptop. Attention:The USB charging cable and LED light were packed in the bottom of the color box if have not found them after take table out. ★ INNOVATIVE DESIGN WITH BUILT IN 10,000MAH POWERBANK AND LED LIGHT - At eTable, we understand that there are times, you really need to work in bed, or lounge/watch a movie on the sofa. 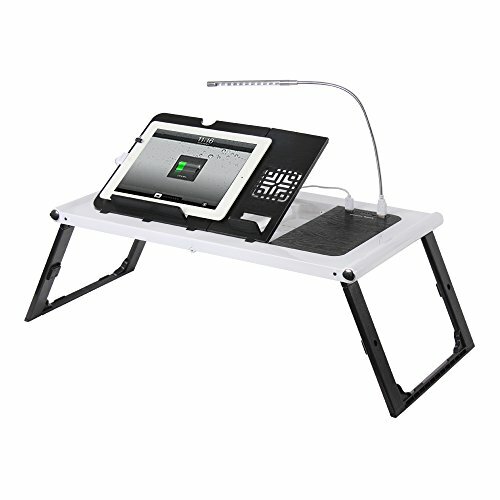 Hence, we are offering you an innovative lap desk/workstation with built-in 10,000mAh power bank to recharge your phones/tablets, with LED flashlight providing illumination so you can see properly. ★ ADJUSTABLE HEIGHT LAPTOP DESK STAND - You can raise the height of your laptop to eye level using our stand. Our laptop table offers you a wonderful viewing angle experience, when watching your favorite soap/tv shows/youtube videos etc! Just sit back, prop a pillow behind you and adjust the stand until the view is aligned perfectly! ★ STURDY AND DURABLE DESIGN - Made from durable ABS plastic and reinforced with tungsten steel. Unlike other laptop desk holders that will crumble under the weight of a notebook computer, our stand is sturdy and can carry a 17" laptop or weight up to 25kg without fretting! It is ELEGANTLY POLISHED and does not look cheap or flimsy. ★ MULTIFUNCTIONAL USAGE - Use it as a reading and writing table, study table for kids to do their homework, a laptop workstation, breakfast in bed lap tray, standing table for office, etc. We left no stones unturned in ensuring that you are totally satisfied. ★ COMPACT DESIGN WITH FOLDABLE LEGS - allows you to stow the desk away when not in use, thereby saving space. It is PORTABLE, LIGHTWEIGHT, easy to carry around and used on the go! If you have any questions about this product by Etable, contact us by completing and submitting the form below. If you are looking for a specif part number, please include it with your message.